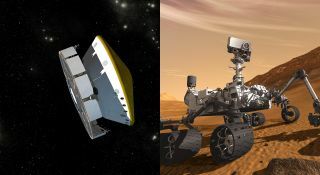 Artist's concept illustrations show (left) the Mars Science Laboratory spacecraft during its voyage from Earth to Mars and (right) the mission's rover, Curiosity, working on Mars after landing. The largest rover ever sent to Mars fired up its rocket engines Wednesday (Jan. 11) in a critical maneuver to refine its path toward an August landing on the Red Planet, NASA officials say. The deep-space maneuver began at 6 p.m. EST (2300 GMT) and lasted nearly three hours to put NASA's 1-ton rover, called the Mars Science Laboratory Curiosity, on track for a planned touchdown in a huge Martian crater in early August. It is the biggest — and most important — course change the rover will make on its 352-million-mile (567-million-kilometer) trip to Mars. "I just left a group of happy flight team controllers in our mission control," rover cruise mission manager Arthur Amador told SPACE.com from NASA's Jet Propulsion Laboratory (JPL) in Pasadena, Calif. "We took a big step towards our encounter with Gale crater on Mars." NASA launched the $2.5 billion Curiosity rover on Nov. 26. The car-size rover is designed to study Mars' vast Gale crater to determine if the region is, or once was, capable of supporting microbial life. The six-wheeled robot carries a nuclear power source and 10 science instruments — including a rock-zapping laser — to perform the mission. "We do that on all of our missions to Mars to protect the planetary environment there," Amador said. To put the rover back on track, mission managers commanded Curiosity to fire its eight rocket thrusters to change the spacecraft's velocity by about 12.3 mph (19.8 kph). The change places Curiosity on a path that will approach 25,000 miles (about 40,000 km) closer to Mars than before, and about 14 hours earlier than the previous course. "The timing of the encounter is important for arriving at Mars just when the planet's rotation puts Gale Crater in the right place," said JPL's Tomas Martin-Mur, chief navigator for the mission, in a statement. Several more engine burns, up to five in all, are scheduled to further tweak the Curiosity rover's path toward Gale crater. The next one is slated for March 29. Amador said a team of 12 mission controllers watched over Wednesday's course correction. While the mission managers were confident of success, there was still some tension. "These are important things, in terms of we have a very valuable spacecraft on its way to Mars with a superb science payload," Amador said. "We're very protective of it, so there's a certain amount of tension when you come upon a moment like this … and that is relieved." By 12 p.m. EST on Thursday (Jan. 12), the Curiosity rover will have completed about 81.2 million miles (130.6 million km) of its trip to Mars. It will be streaking through space at a speed of about 10,300 mph (16,600 kilometers per hour) relative to Earth, mission managers said. During the cruise to Mars, rover mission managers plan to perform a series of health checks and equipment tests to make sure Curiosity is in tip-top shape for its landing on Aug. 4 PDT (Aug. 5 EDT). They are also working to understand why the spacecraft's celestial-navigation software reset itself on Nov. 29. The glitch has not posed a serious concern, but engineers want to understand its cause. The Curiosity rover is NASA's latest mission to the Red Planet. It follows the Phoenix Mars Lander, which launched in 2007 and ended its mission to the Martian arctic in 2008, as well as the powerful Mars Reconnaissance Orbiter (launched in 2005) and the smaller twin rovers Spirit and Opportunity (launched in 2003). The Mars Reconnaissance Orbiter and Opportunity rover are still going strong, though the Spirit rover was decommissioned last year. A European orbiter called Mars Express is also currently circling the Red Planet. "It feels good to be back on the road to Mars here," Amador said. "I always tell people that it feels kind of familiar, this path that we've traveled between the Earth and Mars now."